Pimero is a clean and easy-to-use cloud storage, email management, and product information management software solution which helps organizations and their teams access and share resources online, collaborate on their tasks, and enhance communications in the cloud. 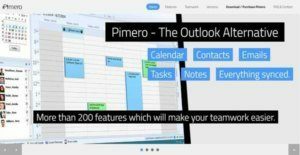 Regarded as an alternative to Microsoft Outlook, Pimero permits users to directly send and receive emails within the solution and quickly search for all their email conversations. The solution offers contact management features which enable users to create contacts, put all the details associated with those contacts, as well as view contact information in various ways. It also comes with an integrated calendar system that lets them organize, categorize, and filter task schedules, appointments, and events. Pimero delivers the ability to share information with coworkers such as schedules, tasks, and private resources and data. It has a mobile app which makes it possible for team members to access contact information, appointments, and resources right straight from their mobile phones. Pimero is equipped with an auto-sync feature which automatically synchronizes data across team members regardless of the device they are using. The other features included in Pimero are instant messaging, Google synchronization, data privacy, serial mailer, notes, print center, RSS feed reader, birthday tracker, and journal. Pimero won’t gain the reputation of being an alternative to Microsoft Outlook if it doesn’t have an email system that matches the capabilities of such popular webmail solution. The email management system is built with an email module which allows users to deliver and collect emails directly within Pimero. Another noteworthy feature of the email module is its capability to organize all emails in one place. In fact, users can even combine multiple emails in a single folder as well as view emails based on the email accounts of those persons who sent them. These email accounts are also color-coded so they can easily identify which accounts those emails are coming from. The email module comes with a spell checker. Thus, as users type in words or phrases and compose email messages, the solution automatically identifies and corrects spelling mistakes. If users need to look for specific emails, they won’t have a hard time doing that. This is because the email module offers a database-driven search filter that gives them the ability to scan over large volumes of email lists and conversations as fast as lightning. An email system is useless if it is not backed up by a contact management system that neatly, efficiently, and dynamically organizes contact information. Such kind of contact management system is available in Pimero. It is built with a contact management system that allows users to create contacts with comprehensive details. Through the aid of data fields, they can enter more than 30 contact information for each contact they have. Pimero’s contact management system also has a grouping functionality. With this functionality, users will be able to organize their contacts into different types of groups or criteria such as company, folder, or category. In addition, all contacts stored and organized within Pimero can be viewed in a variety of ways. Contacts can be displayed in split view, table view, or business card view mode. Scheduling is another core feature included in Pimero. Equipped with an integrated calendar, Pimero helps teams track the schedules of their appointments, tasks, and events. This calendar is designed with a drag-and-drop user interface so it will be very easy for users to create and manage their schedules. What’s great about this integrated calendar is that it comes with six zoom levels, providing users with the capability to scale a calendar sheet from five minutes up to one hour. Also, like its contact management system, Pimero’s integrated calendar has a grouping functionality which means schedules can be organized and viewed based on dates or users. Pimero delivers team collaboration features and one of them is the ability to let team members share resources online based on various permission levels assigned to them. As users define permission levels, they can set whatever criteria they like either individually or by group. As part of its team collaboration features, Pimero makes it possible to create tasks and assign them to team members. They can also set different criteria when it comes to creating and assigning tasks. For instance, they will be able to assign tasks to team members based on how urgent those tasks are, which category those tasks belong to, or which locations the team members are from. Pimero has an auto-synchronization feature. The solution uses a server which can run on multiple devices and editions of the Windows operating systems. As a result, users can start working on a data in one machine, save it there securely, and access it again from another machine without worrying about if the changes they made to the data from one machine is updated on the other machine. Pimero even has an offline feature which means users can still work even if they are currently not connected to the Internet. Once they regain access to the Internet, all the things they did while they are offline will be automatically synced across multiple devices and their team members. The auto-synchronization feature of Pimero is enhanced by its mobile app called Pimero Mobile. This app allows team members to access contact information, view schedules, and manage their tasks from their smartphones. Thus, they can do all of these on the go and from any location, and at the same, enjoy the benefits of Pimero’s auto-synchronization feature. Because of this, they are ensured that they can achieve work continuity, access up-to-date data, and remain productive. Communicating with coworkers using Pimero is a breeze. This is because the solution offers a built-in instant messenger which allows users to exchange chat messages with each other without the need for using any third-party messaging application or logging into an instant messaging service account. Also, all conversations or discussions they are engaging with are securely stored in the solution; eliminating the possibility of unauthorized persons sneaking into their chat messages. If you are considering Pimero it might also be beneficial to examine other subcategories of Best Product Information Management - PIM listed in our database of SaaS software reviews. Each enterprise has different wants and requires an application that can be customized for their size, type of employees and clients, and the particular industry they are in. For these reasons, no platform can proffer perfect functionality off-the-shelf. When you look for a software system, first be sure what you need it for. Read some Pimero reviews and ask yourself do you desire basic tools or do you want complex functionality? Are there any industry-specific tools that you are seeking? Find the answers to these questions to assist your search. There are multiple elements that you need to consider and these include your budget, particular business needs, your organization size, integration requirements etc. Take your time, try out a few free trials, and finally zero in on the system that offers all that you want to enhance your company competence and productivity. How Much Does Pimero Cost? We realize that when you make a decision to buy Product Information Management - PIM it’s important not only to see how experts evaluate it in their reviews, but also to find out if the real people and companies that buy it are actually satisfied with the product. That’s why we’ve created our behavior-based Customer Satisfaction Algorithm™ that gathers customer reviews, comments and Pimero reviews across a wide range of social media sites. The data is then presented in an easy to digest form showing how many people had positive and negative experience with Pimero. With that information at hand you should be equipped to make an informed buying decision that you won’t regret. What are Pimero pricing details? What integrations are available for Pimero? If you need more information about Pimero or you simply have a question let us know what you need and we’ll forward your request directly to the vendor.